Relieve stress and anxiety and stay happy and focused with Focusly. Focusly offers guided meditations and positive energy music, along with ambient and nature sounds to relax you. 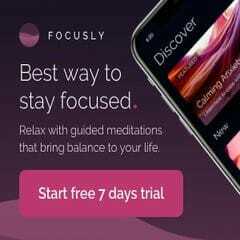 If you're into yoga, meditating, or feel very stressed, then Focusly is for you. To start your 7 day free, cancel any time trial, click "CLAIM OFFER" and sign-up.